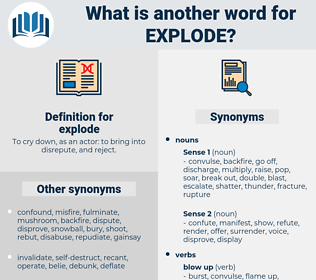 What is another word for explode? To cry down, as an actor: to bring into disrepute, and reject. chipped, erupt, blow, ignite, smash, jump, jumping, shoot, destroy, operate, spark. attest, validate, approve, endorse, build up. The Lorilleux were furious enough to explode, especially since Madame Lerat was now back on good terms with the Coupeaus. Besides, we shall not let it explode, I can answer for that. exploded, egg-filled, exfoliate, exploited, exploit. 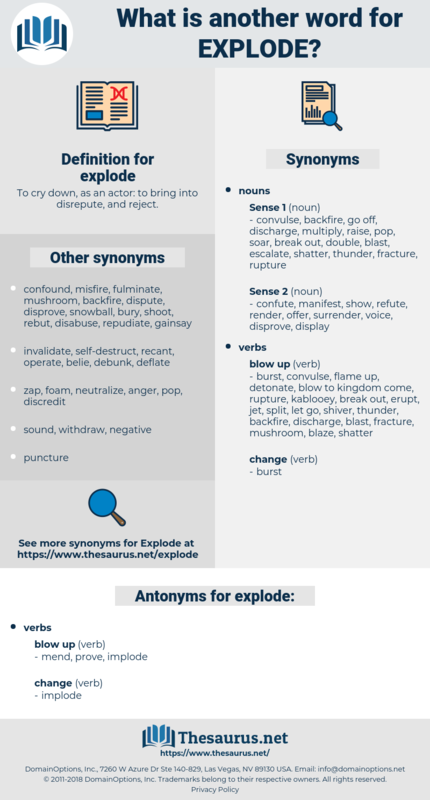 crump, go off, belch, extravasate, erupt. enunciate, sound out, say, pronounce, articulate, condemn, enounce.